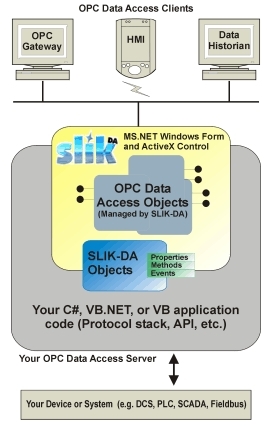 OPC Data-COM is a based on Microsoft’s COM Automation. The component can be used to create an OPC DA, A&E, and OPC Data-UA client in any tool or language that supports COM Automation, from Visual Basic (VB), C++, VBScript (e.g. in ASP, or Windows Script Host), JScript, PHP, Visual Basic for Applications (VBA, e.g. in Excel), Visual FoxPro (VFP), and others. 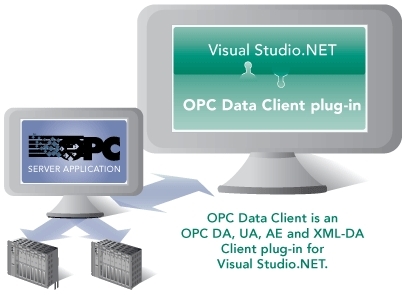 OPC Data-UA: is a 100% managed .NET tool for developing a custom OPC UA client, with native support for both 32 and 64 bit operating systems, primarily targeted for development in Visual Studio 2012. The component can be used in a variety of languages from C#, Visual Basic.NET, and managed C++. Windows Forms, ASP.NET pages, console applications, and WPF applications are all supported. Only DA Profiles are supported.